What is Intraocular (Eye) Melanoma? Intraocular melanoma is a rare disease in which cancer forms in melanocytes in the eye. Melanocytes are cells that make melanin (the pigment that gives skin and eyes their color). Intraocular melanoma begins in the uvea. The uvea has three parts. The iris is the colored area at the front of the eye. The ciliary body is a ring of muscle tissue that changes the size of the pupil and the shape of the lens. 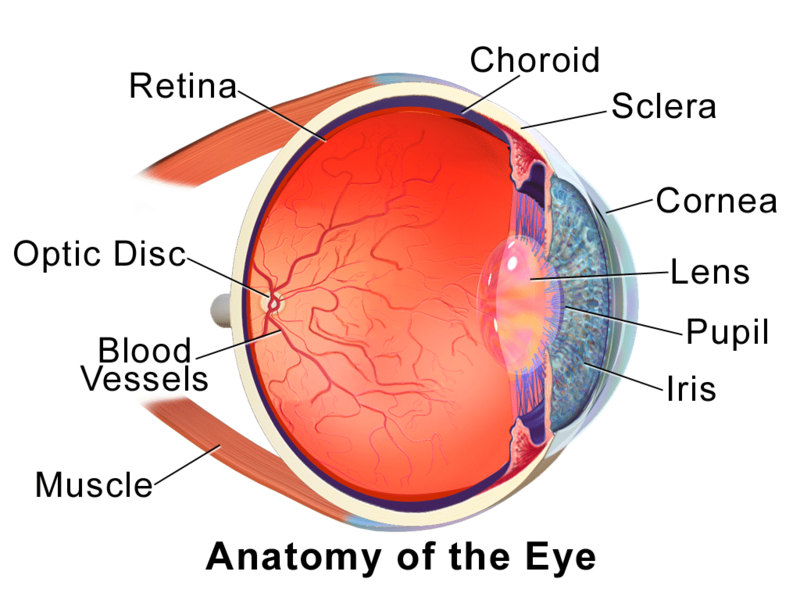 The choroid is a layer of blood vessels that brings oxygen and nutrients to the eye. Most intraocular melanomas begin in the choroid. There may be no early signs or symptoms of intraocular melanoma. It is sometimes found during an eye exam. Risk factors for intraocular melanoma include having fair skin that freckles and burns easily, does not tan, or tans poorly and having blue, green, or other light-colored eyes. Intraocular melanoma begins in the middle of three layers of the wall of the eye. The outer layer includes the white sclera (the “white of the eye”) and the clear cornea at the front of the eye. The inner layer has a lining of nerve tissue, called the retina, which senses light and sends images along the optic nerve to the brain. The iris is the colored area at the front of the eye (the “eye color”). It can be seen through the clear cornea. The pupil is in the center of the iris and it changes size to let more or less light into the eye. Intraocular melanoma of the iris is usually a smalltumor that grows slowly and rarely spreads to other parts of the body. Slit-lamp biomicroscopy : An exam of the inside of the eye to check the retina, optic nerve, and other parts of the eye using a strong beam of light and amicroscope. Gonioscopy : An exam of the front part of the eye between the cornea and iris. A special instrument is used to see if the area where fluid drains out of the eye is blocked. Ultrasound exam of the eye: A procedure in which high-energy sound waves (ultrasound) are bounced off the internal tissues of the eye to make echoes. Eye drops are used to numb the eye and a small probe that sends and receives sound waves is placed gently on the surface of the eye. The echoes make a picture of the inside of the eye and the distance from the cornea to the retina is measured. The picture, called asonogram, shows on the screen of the ultrasound monitor. High-resolution ultrasound biomicroscopy : A procedure in which high-energy sound waves (ultrasound) are bounced off the internal tissues of the eye to make echoes. Eye drops are used to numb the eye and a small probe that sends and receives sound waves is placed gently on the surface of the eye. The echoes make a more detailed picture of the inside of the eye than a regular ultrasound. The tumor is checked for its size, shape, and thickness, and for signs that the tumor has spread to nearby tissue. Fluorescein angiography : A procedure to look at blood vessels and the flow of bloodinside the eye. An orange fluorescent dye (fluorescein) is injected into a blood vessel in the arm and goes into the bloodstream. As the dye travels through blood vessels of the eye, a special camera takes pictures of the retina and choroid to find any areas that are blocked or leaking. Ocular coherence tomography : An imaging test that uses light waves to take cross-section pictures of the retina, and sometimes the choroid, to see if there is swelling or fluid beneath the retina. Gene expression profiling : A laboratory test in which cells in a sample of tissue are checked for certain types of RNA.